I bought this after doing a ktm brake pedal mod and still cracked the clutch cover. have had it installed with the new cluch cover for some time now and has been dropped on it numerous times with out any cracking or damage. I mostly ride technical rocky terrain. the price is amazing for anything with a ktm logo on it. highly recommend for the piece of mind. Put one of these on my 333 and so far it's taken some good hits and done it's job. Put one on the 500 EXC as well. 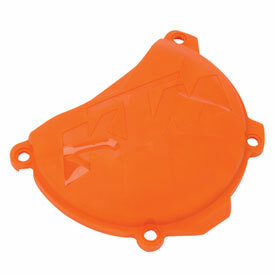 This clutch cover not only looks great, also helps protects your original clutch cover. easy install. I didn't lose any fluid during the install. Wish it was offered in black. Well worth the protection from tip-over foot brake lever intrusions into the clutch cover. Also has the added bonus of keeping the cover looking new underneath. Super easy to install. I bolted this up along with the water pump cover. Nice thick plastic so I think it'll hold up well on the trails. Looks pretty cool also. Remove rear brake spring and bolt up. You'll lose a little bit of oil during install unless you tip the bike on its side. Yes it did. Works great. Is this the KTM powerparts kit? Looks exactly like it. It was when I ordered it a year ago. Fits perfectly, and is a quality plate. I don’t think so, its just a plastic cluth cover. Yes, it matches stock plastic. BEST ANSWER: Don't believe it will fit the 2 strokes. They do make them. Bike specific. Boss has one on his 250 xc. This one is made for the four-stroke 250 XC-F; not sure if it would fit a two-stroke. Not sure if it fits 250. Fits my 350SX-F perfectly. Very happy with it. 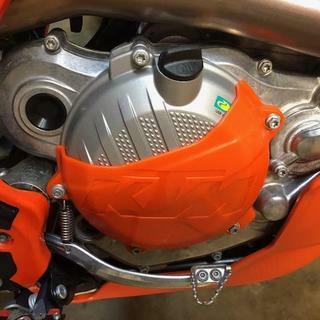 This cover fits 2018 ktm 350 xc-f ?